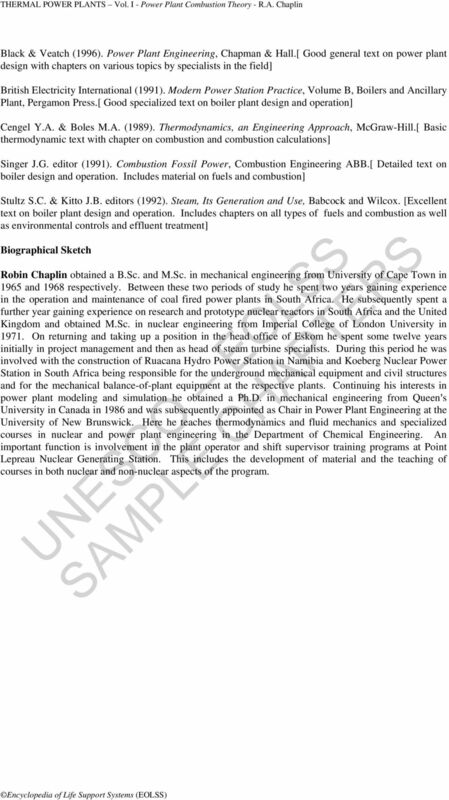 Download "R.A. Chaplin Department of Chemical Engineering, University of New Brunswick, Canada"
1 POWER PLANT COMBUSTION THEORY R.A. Chaplin Department of Chemical Engineering, University of New Brunswick, Canada Keywords: Combustion, Efficiency, Calorific Value, Combustion Products, Gas Analysis Contents 1. 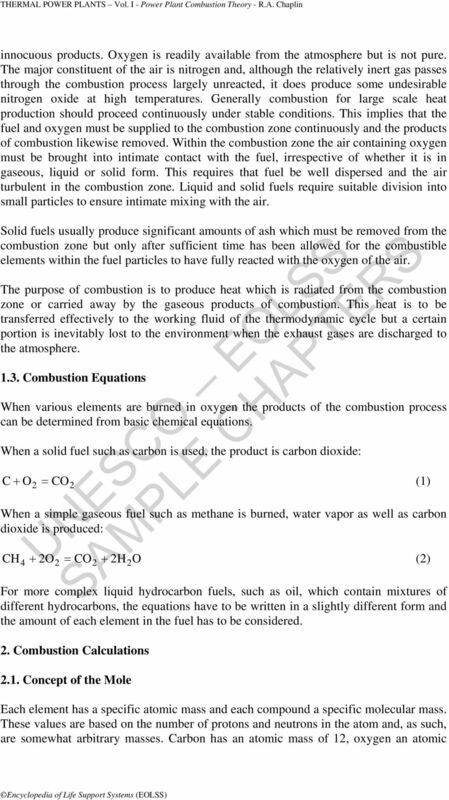 Combustion Fundamentals 1.1. Definitions of combustion 1.2. Principles of Combustion 1.3. Combustion Equations 2. 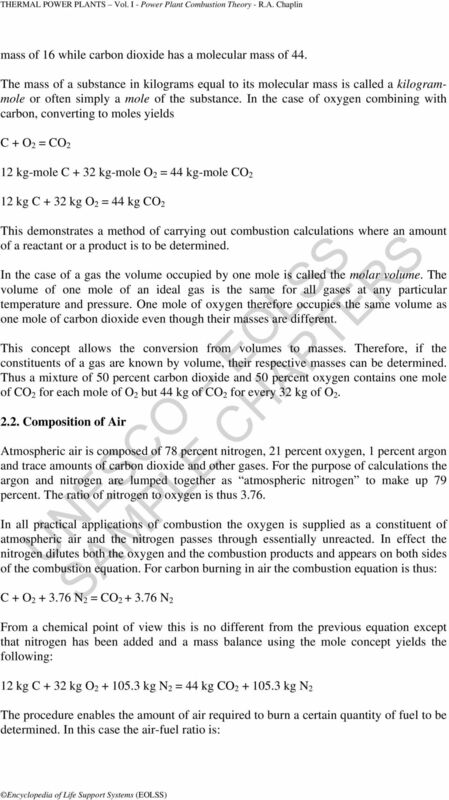 Combustion Calculations 2.1. Concept of the Mole 2.2. Composition of Air 2.3. Excess Air Requirements 3. Energy Balances 3.1. Plant Efficiency 3.2. Boiler Efficiency (Input-Output Method) 3.3. Boiler Efficiency (Heat Loss Method) 4. 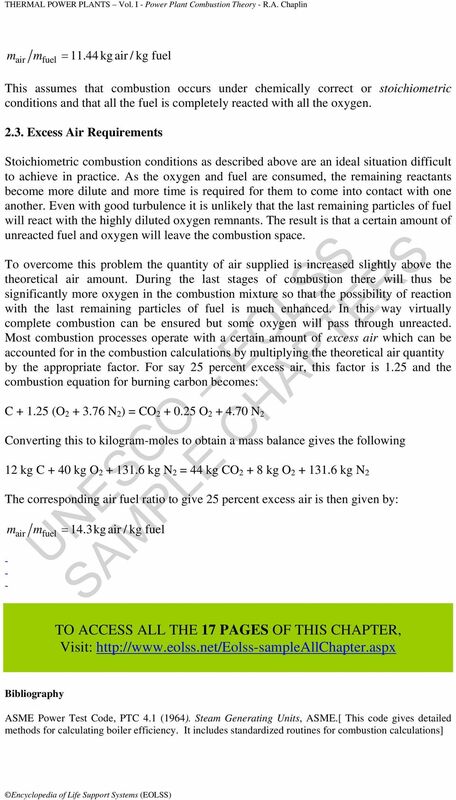 Air-Fuel Ratios 4.1. Review 4.2. Exhaust Gas Analysis 4.3. Methods of Calculation The Mole Method The Joule Method (BTU Method) 5. Heat of Combustion 5.1. Calorific Value 5.2. Higher and Lower Heating Values 5.3. Combustion Temperatures 6. Combustion products 6.1. General 6.2. Nitrogen Oxides 6.3. Sulfur Dioxides Glossary Bibliography Biographical Sketch Summary When a simple fuel such as carbon is burned in air, it combines with the oxygen to produce carbon dioxide. If a hydrocarbon fuel is burned then, in addition, water is produced from the hydrogen. Similarly various combustible impurities, such as sulfur, produce their respective oxides, in this case sulfur dioxide. 6 Black & Veatch (1996). Power Plant Engineering, Chapman & Hall. [ Good general text on power plant design with chapters on various topics by specialists in the field] British Electricity International (1991). Modern Power Station Practice, Volume B, Boilers and Ancillary Plant, Pergamon Press. [ Good specialized text on boiler plant design and operation] Cengel Y.A. & Boles M.A. (1989). Thermodynamics, an Engineering Approach, McGraw-Hill. 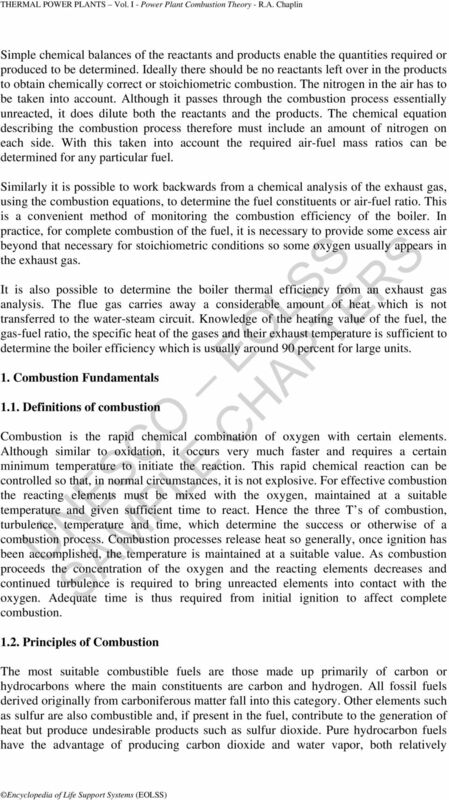 [ Basic thermodynamic text with chapter on combustion and combustion calculations] Singer J.G. editor (1991). Combustion Fossil Power, Combustion Engineering ABB. [ Detailed text on boiler design and operation. Includes material on fuels and combustion] Stultz S.C. & Kitto J.B. editors (1992). Steam, Its Generation and Use, Babcock and Wilcox. [Excellent text on boiler plant design and operation. Includes chapters on all types of fuels and combustion as well as environmental controls and effluent treatment] Biographical Sketch Robin Chaplin obtained a B.Sc. and M.Sc. in mechanical engineering from University of Cape Town in 1965 and 1968 respectively. Between these two periods of study he spent two years gaining experience in the operation and maintenance of coal fired power plants in South Africa. He subsequently spent a further year gaining experience on research and prototype nuclear reactors in South Africa and the United Kingdom and obtained M.Sc. in nuclear engineering from Imperial College of London University in On returning and taking up a position in the head office of Eskom he spent some twelve years initially in project management and then as head of steam turbine specialists. During this period he was involved with the construction of Ruacana Hydro Power Station in Namibia and Koeberg Nuclear Power Station in South Africa being responsible for the underground mechanical equipment and civil structures and for the mechanical balance-of-plant equipment at the respective plants. Continuing his interests in power plant modeling and simulation he obtained a Ph.D. in mechanical engineering from Queen=s University in Canada in 1986 and was subsequently appointed as Chair in Power Plant Engineering at the University of New Brunswick. Here he teaches thermodynamics and fluid mechanics and specialized courses in nuclear and power plant engineering in the Department of Chemical Engineering. An important function is involvement in the plant operator and shift supervisor training programs at Point Lepreau Nuclear Generating Station. This includes the development of material and the teaching of courses in both nuclear and non-nuclear aspects of the program. Name Date Class 1 STOICHIOMETRY SECTION 1.1 THE ARITHMETIC OF EQUATIONS (pages 353 358) This section explains how to calculate the amount of reactants required or product formed in a nonchemical process. 1. Standard conditions are 29.92 in. Hg (760 mm Hg, 14.696 psia) and 68 F (20 C). Assignment 2 Solutions Problems: Gilbert, Chapter1: #1.62, 1.70, Chapter2: #2.57, Chapter 3: #3.12, 3.22, 3.27, 3.44, 3.56, 3.62. CHAPTER 4. Quantities of Reactants and Products. Objectives. You will be able to do the following. THERMODYNAMICS. 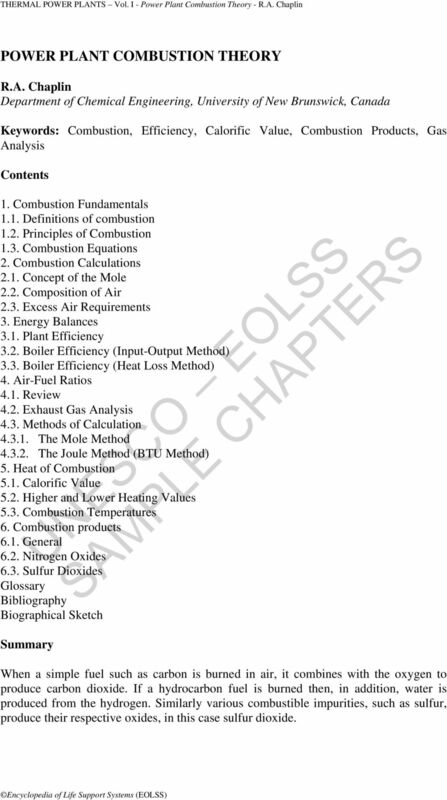 TUTORIAL No.8 COMBUSTION OF FUELS. On completion of this tutorial you should be able to do the following.